In 1997 Trilateral Commission founder Zbigniew Brzezinski, the godfather of the Afghan mujahadeen, wrote a book titled,The Grand Chessboard: American Primacy and its Geostrategic Imperatives. In the book, Brzezinski – who sat on the board at BP Amoco – argues that the key to global power is control of Eurasia and that the “key to controlling Eurasia is controlling the Central Asian Republics”. Brzezinski’s plan called for ruling Central Asia via control of Uzbekistan, which borders Afghanistan to the north. In 1997 Enron attempted to negotiate a $2 billion deal with the Uzbek state-ownedNeftegas with help from the Bush White House. When that effort and other privatization attempts were rebuffed in 1998, CIA-backed Islamist attacks on Uzbekistan’s government were ratcheted up. In 1999 a series of explosions rocked the Uzbek capital of Tashkent. Islamic al-Qaeda-trained militants were to blame. The rebels, who called themselves the Islamic Party of Turkistan, attempted to assassinate socialist President Islam Karimov. They attacked the fertile Fergana Valley in an attempt to disrupt harvests and the Uzbek food supply. Karimov was also attacked by the Islamic Movement of Uzbekistan and Hizb-ut-Tahrir. After the “carpet of bombs” began raining down on neighboring Afghanistan in October 2001, Uzbekistan, along with neighbors Kyrgyzstan and Tajikistan, were coerced into accepting new US military bases. In 2005 Kyrgyzstan’s nationalist President Askar Akayev was deposed by Islamists in the Tulip Revolution. Within days Donald Rumsfeld was meeting with the new leaders. Karimov had seen enough and ordered US troops out of Uzbekistan. Central Asia produces 75% of the world’s opium. According to the UN, the surge in opium production in the region coincided with the disintegration of the Soviet Union, which was “encouraged” by the Reagan Administration and the CIA. It also coincided with theFour Horsemen’s (Exxon Mobil, Chevron Texaco, BP Amoco & Royal Dutch/Shell)Caspian Sea oil boom. The Afghan “paradise of corruption” yielded 4,600 metric tons of opium in 1998. In 1999 the Taliban announced a crack down on opium production in Afghanistan. The move angered the CIA, the Afghan aristocracy and their Turkish Gray Wolves allies, whose smuggling routes mirror those of the Four Horsemen’s Caspian Sea oil pipeline recently opened for business through Turkey. Pakistani writer Ahmed Rashid says the Saudis – fulfilling their usual “paymaster” role – funded the northward shift in poppy production. It was part of a larger operation run by Western intelligence agencies to encircle Russia, seize oilfields and destabilize the entire Central Asia region using Islamic fundamentalists and heroin proceeds. In 1991 Air America/Iran-Contra super spook Richard Secord showed up in Baku, Azerbaijan under the cover of MEGA Oil. Secord did military training, sold Israeli arms, passed “brown bags filled with cash” and shipped in over 2,000 Islamist fighters from Afghanistan with help from CIA-favorite Gulbuddin Hekmatyar. A Turkish intelligence source claims that Exxon and Mobil (now Exxon Mobil) were behind the 1993 coup against elected Armenian President Abulfaz Elchibey. Secord’s Islamists helped. Osama bin Laden set up an NGO in Baku as a base for attacking the Russians in Chechnya and Dagestan. Not content with the Polish Solidarist-led grab of Eastern Europe and the partitioning of oil-rich Soviet Central Asian republics, the CFR/Bilderberger crowd now used mujaheddin surrogates in Chechnya to further squeeze Russia. In 1994 35,000 Chechen fighters were trained at Amir Muawia camp in Afghanistan’s Khost Province. Osama bin Laden built the camp for the CIA. Now-deceased Chechen commander Shamil Basayev graduated from Amir Muawia and was sent to advanced guerrilla tactics camp at Markazi-i-Dawar, Pakistan. There he met withPakistani ISI officials. ISI has historically excelled at carrying out the CIA’s dirty laundry. The Chechen Islamists took over a big chunk of the Golden Crescent heroin trade, working with Chechen crime families affiliated with the Russian Alfa Group that did business with Halliburton. They also had ties to the Albanian heroin labs being run by the Kosovo Liberation Army (KLA). A Russian FSB report stated that the Chechens began buying real estate in Kosovo in 1997, just prior to the US-led partition of Kosovo from Yugoslavia. In February 2002, the US sent 200 military advisers and attack helicopters to Georgia to “root our terrorism”. On September 20, 2002, Russian Foreign Minister Igor Ivanov stated that the al Qaeda-trained Chechen rebels targeting his country were being given safe-haven by the government of Georgia. The Four Horsemen’s strategic Baku-Tblisi-Ceyhan pipeline was set to open through the Georgian capital Tblisi. The US deployment was a smokescreen for pipeline protection. In October 2003 Georgian President Eduard Schevardnadze was forced to step down despite the fact that he had been elected to serve until 2005. IMF darling Mikheil Saakashvili was installed to complete the bankercoup which was dubbed the Rose Revolution. According to The Guardian, Rose Revolution funders included the U.S. State Department, USAID, National Democratic Institute for International Affairs, International Republican Institute, Bilderberg Group, the NGO Freedom House, George Soros’s Open Society Institute and National Endowment for Democracy (NED). When Gulbuddin Hekmatyar ceded Kabulto the Taliban in 1995, Taliban training camps in Pakistan and Afghanistan were taken over by Jamiat-ul-Ulema-e-Islam (JUI) who, with help from Saudi Wahhabist clerics, recruited and trained Islamic fundamentalist volunteers to fight wars of destabilization throughout the Balkans and Central Asia. Financed by Golden Crescent heroin, these terrorists shipped out to fight with Chechen rebels, the Kosovo Liberation Army, the Bosnian Muslim Army, the National Liberation Army (Albanian separatists fighting the government of Macedonia) and Chinese East Turkistan Uighur rebels fighting against Beijing. Out of these same camps came Lakshar e-Taiba and Jamiash-i-Mohammed, who in December 2001 attacked India’s Parliament in New Delhi, killing fourteen legislators and provoking the Indians into a massive military deployment along the Pakistani border. In the early 1990’s, the CIA had helped Afghan mujahadeen veterans get passports to immigrate to the US. The Al-Kifah Refugee Center in Brooklyn, where many Afghans landed, turned into a CIA recruiting base for wars in Yugoslavia and Central Asia. Among those who frequented the center were El Sayyid Nosair, who assassinated far-right Israeli Rabbi Meir Kahane; and Sheik Omar Abdel Rahman, a fundamentalist Egyptian cleric linked to the assassination of Egyptian President Anwar Sadat. The CIA brought the sheik to Brooklyn as a recruiting tool. His son – a key al Qaeda leader fighting the US in Afghanistan – was killed in December 2001. According to Mossad intelligence reports, as of July 1, 2001, 120,000 metric tons of opium was warehoused in Afghanistan a waiting shipment. Two months later the US was bombing Afghanistan. Opium shipments resumed. Amnesty International and UN Human Rights Commissioner Mary Robinson called for an investigation of an incident at Mazar-i-Sharif where Dostum oversaw the surrender of hundreds of Taliban and al Qaeda fighters, who were then massacred in a bombing raid by US aircraft during in an alleged prison uprising. The “American Taliban” John Walker Lindh was among the few survivors. The prisoners had come from Konduz where, according to investigative journalist Seymour Hirsch of The New Yorker, the White House had ordered US Special Forces to create an evacuation corridor whereby Pakistani military aircraft were allowed to fly no less than 2,500 al Qaedaand Taliban fighters – along with their ISI advisers and at least two Pakistani generals – to safety in Pakistan. While the Bush Administration used an alleged al Qaeda/Saddam Hussein alliance as a pretext to turn its guns towards oil-rich Iraq, al Qaedaand Taliban leadership remained unharmed in Pakistan. In Afghanistan US envoy and former Unocal executive Zalmay Khalilzad was busy paving the way for the construction of the Unocal-led Centgas pipeline. Later Khalilzad became US Ambassador to Iraq. 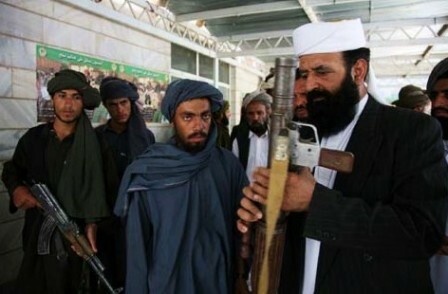 US Ambassador to Pakistan Wendy Chamberlain huddled with Pakistan Oil Minister Usman Aminuddin and the Saudi Ambassador to Pakistan to plan the pipeline, which would run next to Khandahar – home of Taliban leader Mullah Mohammed Omar. The World Bank and IMF set up shop in Kabul after a twenty-five year hiatus. Halliburton’s Brown & Root subsidiary and other post-war “reconstruction specialists” lined up for contracts. On December 27, 2002, Turkmenistan, Pakistan and Afghanistan signed a deal paving the way for the Centgas pipeline. The US-handpicked Afghan Prime Minister Hamid Karzai emerged after the assassination of contender Abdul Haq, who walked into a trap inside Afghanistan while supposedly under CIA protection. Haq’s handler was Robert “Bud” McFarlane, Reagan’s National Security Advisor who now runs a K Street oil consulting firm. Haq had no ties to the oil industry and was considered by the CIA to be too cozy with Iran and Russia. Rabbani’s Northern Alliance military commander Sheik Massoud was mysteriously assassinated just two days before 911. The Karzai government represents a return of the Afghan monarchy, compliant as ever to international banker interests in the region. In 2005 Chevron Texaco bought Unocal, cementing Four Horsemen control over the trans-Afghan Centgas pipeline.